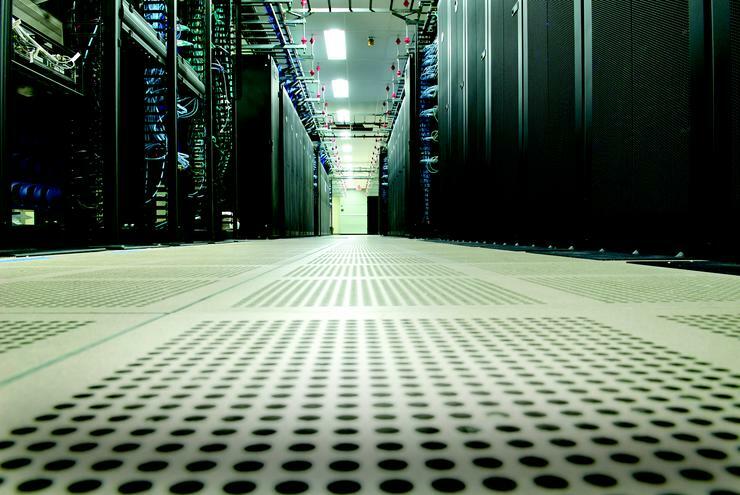 Is hybrid IT the new normal in the enterprise? Hybrid IT is set to become a new hotspot for local partners, with new research from Dimension Data suggesting that the technology is becoming a standard enterprise model. According to Dimension Data’s Success factors for managing hybrid IT report, informed by data from 451 Research, end-user demand for new hybrid IT features and faster provisioning, along with constrained data centre space are the top factors encouraging enterprises to shift workloads off-premises. “With data and processes shifting across multiple cloud and non-cloud environments, a new approach to management is called for,” Dimension Data Group CEO, Jason Goodall, said. “IT managers are under tremendous pressure to seek new ways to manage and secure multiple IT environments in an effective manner. “Automation is important because it helps reduce the operating costs, as well as the pain caused by the growing complexity of business processes and management tasks. It is simply no longer appropriate or cost-effective for these tasks to be done manually,” he said. The survey, which queried more than 1,500 large organisations in the US, Europe, Asia Pacific and South Africa, revealed that, while hybrid IT is on track to become the norm among enterprise IT footprints, a single, well-trodden path to get businesses there is yet to emerge. While there are more options for deployment venues and ways to consume IT resources, according to the report, the way in which applications are developed is also changing. “Agile development, DevOps, containers and microservices all promise to lower the costs and effort of deployment, and speed of time to value for applications of all types," the report stated. "Containers continue to be a driving force in DevOps; 52 per cent of enterprises we surveyed are already using container technology, and as usage of containers increases, this should make applications work more flexibly across heterogeneous infrastructure,” it said. 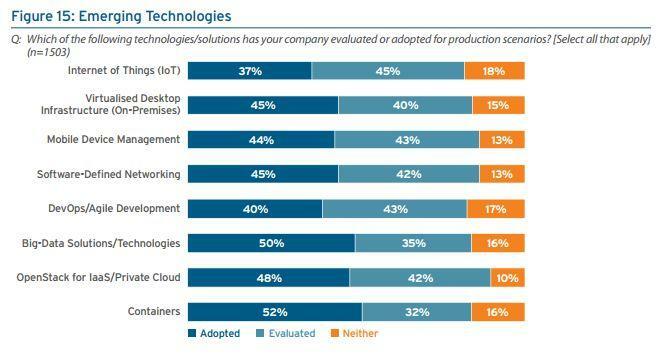 While hybrid IT stands as a new focus area for partners, some of the other technology areas in which partners are likely going to want to flex their muscle include containers, with more than half of respondents already having adopted the technology, and big data solutions, which have been adopted by half of those surveyed. Other areas of focus include OpenStack for infrastructure as a service and private cloud, adopted by 48 per cent of those surveyed, software-defined networking, which has been adopted by 45 per cent of respondents, and virtualised desktop infrastructure, also with a 45 per cent adoption rate. The good news for partners is that enterprises are spending a significant portion of their IT budgets with third-party service providers on managed and professional services, according to the report. This investment in external IT partners is happening for a number of reasons, according to the research, including helping to lower costs, freeing up IT staff to focus on other projects, to improve security and to provide specialised technical expertise, among others. 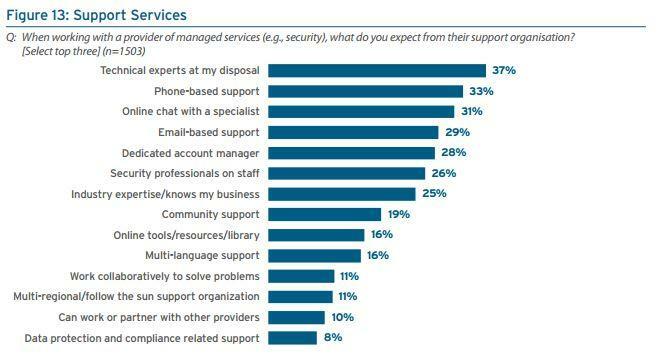 Among the top services expected of managed service providers, according to the research, are technical experts, phone-based support, online chat with specialists and email-based support. According to the survey, 41 per cent of organisations work with multiple vendors and manage them themselves, and another 37 per cent work with a single vendor that can offer a broad range of products and services it builds and manages.